While one river cruise line was launching its newest vessel in Bordeaux last week, another was announcing plans to take to the high seas. Viking River Cruises – familiar to ITV viewers for their sponsorship of drama programmes – is ready to branch out into Viking Ocean and will have its first ship, Viking Star, sailing from May 2015. Like its historical predecessors, the Vikings could be about to conquer the world all over again. Viking River has seen unprecedented expansion in the last couple of years – 10 new longships were christened a few weeks ago in Amsterdam and 14 more are being built for 2014. Its new ocean-going ship will carry 928 passengers and is aimed directly at the market sector currently occupied by premium and luxury lines such as Oceania, Crystal and Azamara. A second ship will be launched in 2016, and the company has options to build another four after that. Viking chairman Torstein Hagen, announcing his plans in the suitably plush surroundings of LA’s Beverly Hilton Hotel, took a swipe at some of his competitors when he said: “In the race to build bigger ships, many cruise lines have lost sight of the destinations to which they sail. Classified as a small ship, the 47,800-ton vessel – to be built at Fincantieri’s Marghera yard near Venice – will have interiors created by London-based SMC Design, who have worked extensively with Norwegian Cruise Line and were responsible for the Empire Casino, Champagne Bar, and Queens Room on Cunard flagship Queen Mary 2. Initial impressions of Viking Star are that the interiors will be much simpler with a more contemporary feel. There will be five stateroom categories, and they all feature balconies, king-sized beds and generous showers. One of the two swimming pools is particularly spectacular; an infinity pool with a glass wall overlooking the stern. In keeping with the company’s Nordic heritage, the spa will include a snow grotto, with snowflakes descending through the chilled air – perfect for cooling off after a sauna. There will be a double-height Explorers’ Lounge at the bow, and a peaceful Wintergarden for afternoon tea. Restaurant choices include a main dining room with floor-to-ceiling windows that can be opened and specialty outlets such as the Chef’s Table, Italian Grill and Kitchen Table – with no additional charge. Drinks with lunch and dinner will also be included in the fares, expected to start from around £2,000 per person per week. The claim to have more al fresco dining than any other ship will have to be measured against newcomers such as Norwegian Breakaway, with its extensive Waterfront area, but there is no disputing that Star’s free wi-fi will be a first at sea – unless someone introduces it in the meantime. 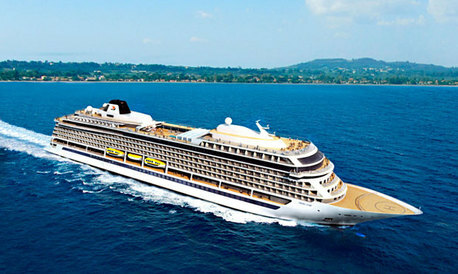 Viking Star’s maiden season of cruises in Scandinavia, the Baltic and the Mediterranean is initially on sale only to the US market; it will be later that year before the UK, Australia and New Zealand are invited on board.  Azamara’s Larry Pimentel, in the UK this week for the CLIA UK Selling Cruise conference, will no doubt disagree with Hagen that his own company has “lost sight of the destinations.” But I’m sure that, as the boss of a two-ship line whose vessels are both 13 years old, he would love to be in the position of announcing a newbuild. I’ll have to ask him when we meet on Friday.